Drawn into an epic year-long virtual reality game, eighteen-yearold Nova finds her life fractured and her strength tested as she fights to become the last player standing in this action-packed novel inspired by the revolutionary Oculus Rif - and written by a groundbreaking digital innovator who is already turning fiction into reality. In the year 2020, London-based gaming company Spiralwerks will launch their ambitious year-long virtual reality game, Solaversia. Over 100 million players from around the world, each given a unique number in The Player’s Grid that corresponds to their individual profile, will compete against each other across the solar system to be the last person standing and win the £10 million grand prize. Nova Negrahnu and her friends Burner and Sushi cannot wait to start playing. But when an international terrorist organization sets its sights on the game and it’s creator, Nova finds her life turned upside down, as the line between simulation and reality blurs. Can she navigate between playing the game, coping with all the issues an eighteen-year-old girl faces and avoid the very real and present danger mounting outside Solaversia? I never consciously chose to write Solarversia from the perspective of Nova Negrahnu, an eighteen year-old girl; I always felt that she chose me. Nova was there from the very beginning, asking - demanding - to be the star of the show. It was slightly daunting at first, writing from such a foreign perspective, so I tried a couple of things to get into her mindset. First, I spent a lot of time reminiscing about school and university. I jotted down memories: the things that made me laugh and cry, the names of fellow pupils and teachers, and the way things worked back then (the prefect system, detentions, attending lessons and lectures). I wanted to know her fears and desires, to know her heart as well as her mind. Most stuff didn’t make it into the book, but I’ve learned that’s usually the way with writing. You search far and wide, hunting for gold in them thar hills. Most of what you find is dirt … but if you’re lucky, hidden among it, you might discover a couple of nuggets shining bright. The second thing I did was to pay more attention to strong female leads, both in fiction and in the real world. Nova was always a force of nature: strong-willed, stubborn and determined. I wanted these traits to come across naturally, and worked hard to make her appear authentic. Fortunately, I had a (brilliant) female editor to help achieve this. I remember one scene in particular: Nova and her best (male) friend, Burner, were running from a horde of crazed circus animals when I had Burner help her through a smashed window. My editor amended the scene, leaving a comment that said, “Nova don’t need no help getting through no window.” She was correct of course. If anything, Nova would be the one helping Burner through the window. Looks like I still have lots to learn. Thank you so much for joining us today Toby. About the author: Toby Downton lives in North London and is head of business development at Matter, a digital innovation consultancy he co-founded. He has previously worked at the London Stock Exchange and has also lived in Australia. Solarversia by Toby Downton (published by CreateSpace, RRP $14.00 paperback, RRP $4.50 ebook) will be released August 31st and will be available to purchase at online retailers including Amazon.com and can be ordered from all good bookstores. For more information please visit solarversia.com. The relatively new genre of virtual reality inspired science fiction, centered around the gaming industry is booming, with Ernest Cline’s bestseller Ready Player One already in production for a major movie adaptation directed by Steven Spielberg. Downton is emerging as a driving force in the VR revolution. Solaversia is just the first step in his thrillingly ambitious multi-platform story-telling experience that will explore the relationships between artificial intelligence, technology and the human spirit. Downton will be incorporating his tech-company - Spiralwerks - in the real world, developing Solarversia as a commercially available game, ready to storm the games market in 2020. Accompanying the publication of the Solarversia book, A Golden Ticket promotion will be launched this year, enabling games enthusiasts to win 100 specially reserved places within the Player’s Grid”, through competitions, charity auctions and book sales. I have loved Mercedes Lackey for many years. 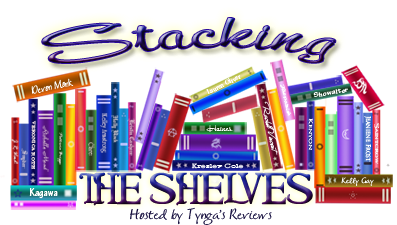 While I may not go out and buy her books the instant they hit the shelves, I am always aware of new books and I try and read as many as I possibly can. Her Obsidian trilogy and 500 Kingdoms series are amongst my very favourites. What I love is her variety. Her books range from SciFi, to fantasy and every possible shade in between. She has fairytales, dragons, mages, elves, owls and spaceships, and just about anything else you can think of. She writes by herself and she writes with other authors. A very versatile author indeed. 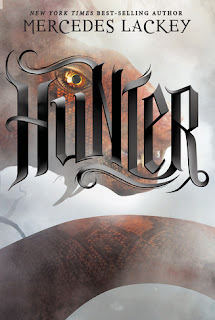 Hunter is the newest YA novel and captivated me from page one. Joy is a down to earth, pleasant, well adjusted protagonist who is comfortable in her own skin. She thinks problems through, isn't impulsive and allows herself time to break down and recharge once she has the job done. I just loved her non -confrontational way of dealing with bullies and the very special relationship she has with her hounds. I also loved that she acknowledges that she still has a lot to learn. Josh, Karly and Mark were all great characters too. We get to know them a little, but are aware that there is still more to learn. There's friendship and fun, work and stress, fighting and dying - yup, she's not afraid to kill off characters, much to my distress. There is also a little romance, although only a very little and it is by no means a focus of the story, which makes this book fairly suitable for younger teens. Expect to see all those nasty creatures from old fairytales - goblins, tommyknockers, wyverns, vampires, 'folk' and any number of unusual nasties and they are all up to no good. I'm thinking that, given the ending, there are going to be one or two more books, although this one ends fairly satisfactorily there are definitely some non-resolved issues. I will be keeping my eye open for sequels. With lots of mystery and tension, lovable characters and some intense action, Hunter was pure delight to read. I'll definitely be recommending this one. 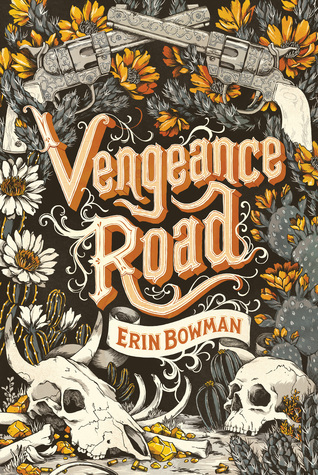 What to tell you about Vengeance Road? This was an interesting historical novel set in the old west that is loosely based on an old western legend about a lost gold mine. Ms Bowman has obviously studied the history of the period and knows the location well, but where the book fell short for me was the characters, or the main character in particular. For some reason I didn't really connect with Kate. She was fairly well written and her naivete about some things did ring true, but ..... I did enjoy Will and Jesse however. In fact I adored Will's dip spitting, somewhat tarnished view of life. The romance? Slow. Very slow, which was actually quite nice and entirely believable given the characters and the circumstances. The way things play out may surprise you. There was a big reveal towards the end that I don't think many will see coming, I certainly didn't. I didn't find the book very suspenseful though. For me it just sort of ambled along at a steady pace and the outcome was never really in doubt, and other than my strange almost dislike of Kate, I really quite enjoyed the story itself. In the end it was fun but not outstanding and I'll be really interested to hear what you all think of it. 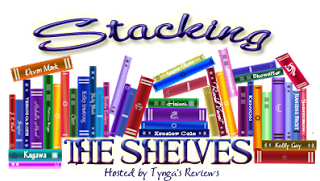 Guest Post by Patricia Vanasse, author of Awakened. In Resilient, you got to meet Livia, Adam and Daniel. In Awakened, you’ll meet new characters that will bring this story to whole different level. Each has their own stories to tell and abilities to explore. Please, allow me to introduce you to these amazing people. Special Ability: Memory Manipulation, including projecting lost memories, creating new ones, or deleting all memories from one’s mind. Favorite Song: Radioactive by Imagine Dragons. Desire: To redefine her life. Profile: Raised in The Agency, Brooklyn never desired to live a normal, mundane life, until she met Adam. As she slowly allows her humanity and emotions to surface, Brooklyn decides that the world has more to offer her than she’d ever imagined. Special Ability: Accelerated probability, which allows him to sense all the variables of any situation. With that, he can foresee the outcomes of the choices he can make to reach the conclusion he wants. Favorite Song: Felling Good by Muse. Desire: To understand his abilities. Profile: Mason entered college at the age of 16 and is perceived as genius by his Yale peers. Determined to find answers for his special abilities, he hacked into the FBI classified files revealing dirty business within the bureau to the world , but found nothing on super humans. Now chased by government officials, Mason has to escape his life if he wants to find out who and what he is. Looks like: Mary Elizabeth Winstead as Ramona Flowers from Scott Pilgrim vs. the World. 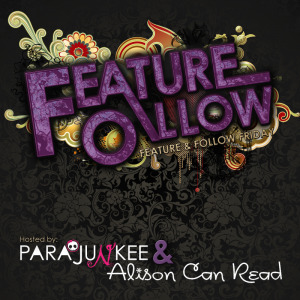 Profile: Abandoned by her adoptive father, Jordan blames her ability for the destruction of her family. After her mother is taken to a rehab facility, Jordan is forced to use her ability for money and gets involved with a gang who threatens her life if she refuses to help them. 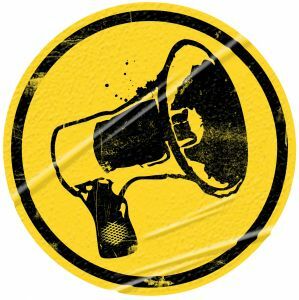 Special Ability: Persuasion, the ability to force others to obey one's spoken imperatives. Desire: To make a difference in the world by working with The Agency. Profile: Alexis left her adoptive parents to join The Agency and its causes. Special Ability: Telekinesis, the ability to move objects with the mind. Favorite Song: Seven Nation Army by The White Stripes. Desire: To be accepted for who he is. Profile: Forced by his adoptive father to fight at illegal fight clubs, Ethan pretends to be this cold-hearted guy, when in truth, he is a caring young man. Now tell me, who do you want to hang out with? Firstly, are you really that surprised that this would be my Stacking the Shelves choice? 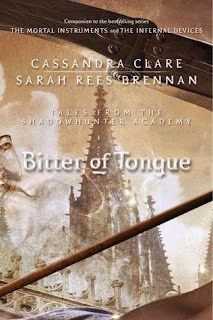 Bitter of Tongue is #7 in the Shadowhunter Academy series of novellas. Look for a review shortly. Cassie is gearing up for the next series in her Mortal Instruments spin off. She seems to be carefully laying out the groundwork for readers to get comfortable with new characters such as the Blackthorns and the Carstairs. Can't. Wait. Have you pre-ordered The Dark Artifices yet? she secretly questions why someone like Ken would be interested in a geek like her. learns the disturbing truth about Ken. and fights to prevent her world being destroyed. The fate of the island rests in the hands of one girl. when reading the sequel, Dark Waters, that’s coming out this fall! second grade “school days” book that when she grew up she wanted to write books. Earning a BA in English literature and French from Houston Baptist University and having taught high school English as she pursued her MA in English literature at DePaul University, her childhood passion has morphed into an adult career focused on young adult urban fantasy. Tracy has lived in Canada, France, and England and currently resides in the US with her husband and two children. Well, what can I tell you about Uprooted other than 'Read It!'. I will admit that I first took this one home because I thought it was about dragons, but of course it's not. It's about wizards and magic and horrible scary creatures in a deep, dark, terrifying wood. It's fantasy at its best, that reads a little bit like a cautionary tale or fairy tale, but is so much more. I loved Agnieszka. She was normal and real and had to work hard to find solutions to her problems. I loved that things didn't come easily for her and that when she does realize she has gifts she has to research to help herself. Some nasty things happen to Kasia and Agnieszka never gives up on her, even when Kasia's own family don't want her back. The wizard, Sarkan, is a bit of an enigma and his relationship with Agnieszka was interesting. The affection between the two of them takes a long time to grow and was all the more believable for it. The antagonist in this book is not a person, but an entity. A weird, frightening, awesome entity that grows and destroys. It was so different and unusual and gave me the shivers on several occasions. The story behind the wood, which we find out right at the very end, was complex and took some serious unraveling, but ultimately made sense. The ending may surprise you - it did me - but it works really well. Agnieszka is 17 or 18 in the story, but it is not a YA book. 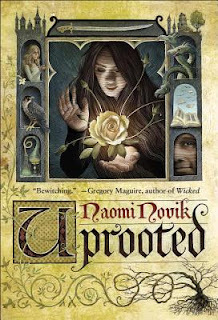 It's a long book that will suit YA readers if you like complicated fantasy stories with complex characters and I highly recommend it. It's also a stand-alone which gives it bonus points in my mind, since we see so few of them these days. Ever have one of 'those' days? The day I started Court of Fives was one of them. It started with me putting my knickers on backwards - stupid right? Swiftly followed by putting my bra on inside out - yes I can see you smiling. Then I realized that every single pair of summer pants I own was in the wash - you see where this is going right? Well I decided just to sit down and have a cup of tea and read and give the day a chance to right itself and I opened my advanced copy of Court of Fives - which had no cover pic. I'm sitting there reading away thinking, gosh this reminds me of Kate Elliot. I must have thought that at least three times before it dawned on me there was a very good reason it reminded me of her writing. You've had one of those days right? It can't just be me! Anyway, on to the book. Court of Fives started out a little slowly for me. I really wasn't too sure of the characters. Seems like there were a lot of them and everyone had at least two names, some even ended up with three and it took a long time to get them all sorted out. So much so that I wasn't really connecting with the characters themselves. But, Ms Elliot writes a good story and Court of Fives was no exception. It was exciting and often suspenseful without seeming dragged out. My ecopy told me I had 287 pages but the hard copy seems to have almost 450, and it certainly didn't seem that long. The story skipped along and there always seemed to be something happening. It was a nice change from the current dystopian craze where games are a matter of life and death with dire consequences if you fail. Yes, you can die on a Fives Court - but because of an accident, not because someone is out for your blood. These games are tests of skill, stamina and aptitude and I could imagine them being played. The characters - well as I said there were a lot of them and it took me a while to get them sorted out and to connect, but in the end I did. Jessamy (Jes, Spider) was particularly driven by her desire to compete on the Fives court, although her loyalty to her family was admirable. She made a decision at the end of the book that had me cheering. It was rather unexpected, but very believable. Can't say much more or it will be a spoiler, but it made a huge difference to me in accepting her. Kalliarkos (Kal, Beacon, Lord Garon) was kinda cute. All he wants is to run the Fives, but his family has other ideas. There is romance here. Not the love at first sight until the end of days kind, but young and kind of sweet. There are also a couple of surprises where Jes's sisters Amara (Amiable) and Maraya (Merry) are concerned. Those relationships were interesting, as was the relationship between Jes's parents. Some good messages there. In the end though, it was the fast paced storytelling that kept me reading. There is a fair bit of political intrigue that keeps the story going. I loved reading about the Fives courts and the trek through the tombs was harrowing. Where Ms Elliot came up with the idea for the funeral practices I do not know. 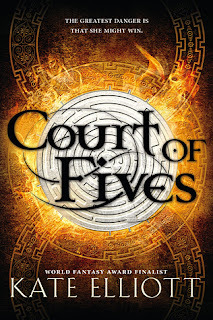 Court of Fives is not going to be for everyone, but it certainly gets a reserved thumbs up from me.